Riverside Singita Boulders lodge in the game rich Sabi Sand Reserve presents an exclusive Big 5 safari experience. Bask in its exceptional design and décor, inspired by a boulder buttress, with sheer glass walls and wrap-around views from spacious living and dining areas, and 12 luxurious suites with private pools. The lodge is situated in the Sabi Sand Private Game Reserve on the family-owned, 44,500 acre (18,000 ha) Singita Sabi Sand private concession. Singita Boulders Lodge offers twelve suites, all with their own en suite bathroom and shower, outside shower, private heated swimming pool, double-sided fireplace, mini bar and fridge, room mini safe, air-conditioning, overhead fans, private lounge, direct dial telephones and game-viewing deck. All the suites have direct dial telephones and free Wi-Fi. Game Drives: Hop on board an open-air Land Rover for and experience South African wildlife first hand. Whether you’re and early bird or a night owl, day and night tours are offered every day. As you drive through Sabi Sand Game Reserve, have close encounters with leopards, lions, white and black rhino, elephants, hippopotamus, and cheetahs. Guided Safari Walks are also available. Community Visits: Guest are invited to be part of the Tsonga culture with visits to the nearby communities of Justicia and Lillydale that border the Sabi Sand Game Reserve. In partnership with the READ Educational Trust, visitors can learn about his program by joining the children in their playrooms and see firsthand how they can help to improve the education system. 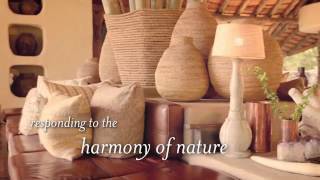 Singita Boulders Lodge can be included in any of our itineraries. Call a Swain Destinations Specialist today at 1-800-227-9246.